- James Cameron, commenting on an angelic underwater life form. I recall reading a few years ago an article suggesting that we have only discovered approximately 10 percent of the ocean's life-forms. Watching Aliens of the Deep, a documentary by James Cameron and Steve Quale, makes accepting that claim all the more easy. Taking revolutionary technology into realms of the Atlantic Ocean never before captured in a major motion picture, Cameron and his team deliver an extraordinary visual experience. There are many scientists and graduate students featured, though none of them capture your imagination like the various spectacles captured by the cameras. Each person on this underwater expedition has his or her own agenda, with some studying the seismic activity of the mid-oceanic riff, while others are examining different species in an effort to learn about the possibility of life on other planets. Indeed, there are many interesting theories discussed here, such as the possibility that life on Earth may have originated on Mars. There's also an in-depth look at a NASA plan to use the techniques being employed by Cameron and company to search the oceans of Jupiter's moon, Europa. The movie very clearly illustrates that exploring Earth and outer space are not entirely dissimilar, but it seems to make a mistake in overemphasizing the parallels. After all, just because all life on Earth seems to necessitate water does prove that such is the case with the rest of the universe. Aliens of the Abyss is at its best when simply showing its audience the mysteries that lie beneath the ocean's surface. Various members of the crew contribute a narration and there are a few brief scenes showing the goings on of the ship, however none of the actual commentary really adds to the spectacle. Often times they're simply describing what they are seeing and exclaiming how awesome the events are. (Well, duh!) While watching the various images captured by high-tech HD cameras, my mind kept pondering larger questions. When the crew comes across an indescribable being, something that looks like a cross between an angel's spirit and window curtains, I wondered how long it had been there, would it ever be seen again, are there more like it, and what role it plays in the world. The answers, of course, allude me and there's no way the documentary can answer them. This is not a film meant to unlock the mysteries of life, but to open our minds to the various possibilities and connections that exist, whether we'll ever discover them or not. Therein lies the purpose of Aliens of the Deep. Through exploring the ocean and linking it to outer space, Cameron and Quale are, in fact, examining one of the most essential elements of human existence: the pursuit of knowledge. At times the researchers come across as arrogant, trusting too much in their technology and various theories. As they delve deeper into the ocean, every vent and crab seems to bring them closer to their own conclusion. For me, each discovery they encounter doesn't really seem to prove anything other than the immortal words of Socrates: "All I know is that I don't know." The world is filled with beauty, enchantment, and unexplainable phenomenon. Strip Aliens of the Deep of its human rationalizations and it just about perfectly captures that. Image Transfer Review: Both versions of Aliens of the Deep are presented here in 1.78:1 anamorphic widescreen. Neither is shown in 3D, but the picture here is so vivid that you still will think you are down in the ocean with the explorers. There aren't many colors, but the life-forms astonishingly look like you can reach right out and touch them. Audio Transfer Review: The Dolby Digital 5.1 mix contains some nice sound separation and directionality, but it is the general atmospheric effects that make it so enthralling. The musical score and underwater mix permeate from all directions. Dialogue is always audible and crisp. Very nicely done. A French Dolby Digital 5.1 mix is also available. Extras Review: Apart from featuring two versions of the movie, the only special features are the trailers for The Chronicles of Narnia: The Lion, the Witch, and the Wardrobe, Flightplan, and Toy Story 2: Special Edition Two-Disc DVD. Each is shown in nonanamorphic widescreen with Dolby Digital 5.1 sound. 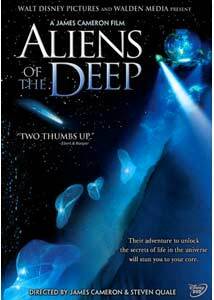 Like Winged Migration, Aliens of the Deep is a visually stunning examination of our world. This DVD is light on special features, but the movie receives a gorgeous presentation.